My wife and I have a booth in one of the local antique malls, so we are always going to garage sales and junk stores looking for things to put in our booth. When we’re out junking, I always keep my eyes open for items that I can use for my survival preparations. 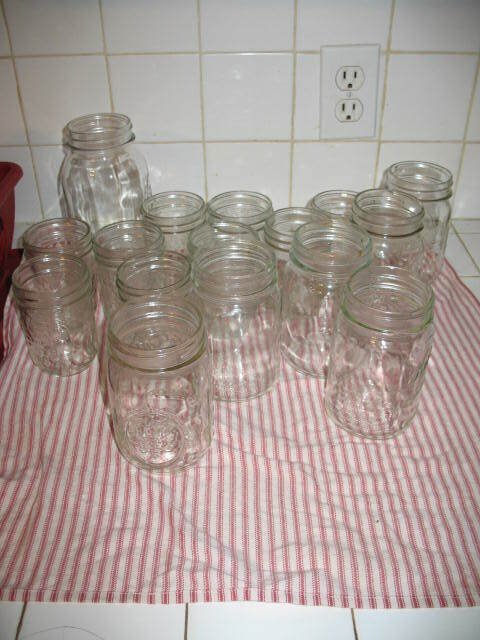 At one garage sale I bought over 200 canning jars for $24. A super deal. Canning jars can be reused for years, and the rings around them can be reused also if they’re not damaged, but the lids must be new every time you can. I always buy lids at the end of the summer when stores are trying to get rid of them. They always put them on clearance. It’s more profitable for them to sell them at near cost than it is for them to store the lids until next spring. If they are marked low I will buy a lot of them. I probably have eight or nine hundred lids in my food storage. They don’t take up hardly any room. Of course it takes more than jars and lids to can food, so I keep a good supply of other things. I like to keep about five gallons of white vinegar on hand and I also keep at least 25 pounds of salt and 25 pounds of sugar. 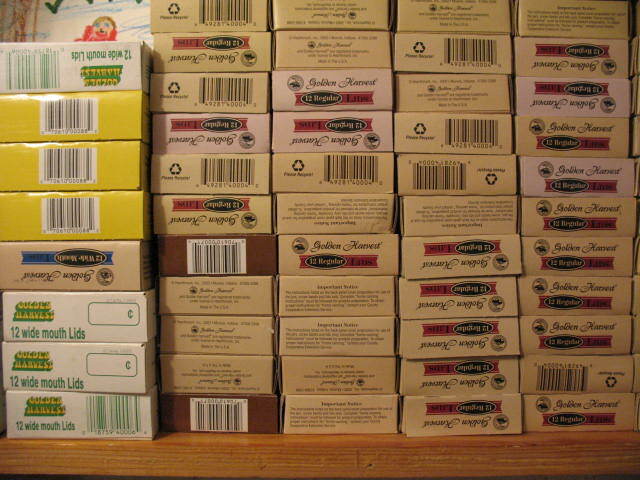 I buy canning spices in bulk and store them in sealed glass jars. Dill seed, turmeric, cloves, cinnamon, mustard, black pepper, peppercorns, all spice, nutmeg, and bay leaf are some of the spices I keep on hand. I also keep a lookout for 5 gallon plastic buckets, one gallon glass pickle jars, and the metal cans that pre-popped popcorn comes in. 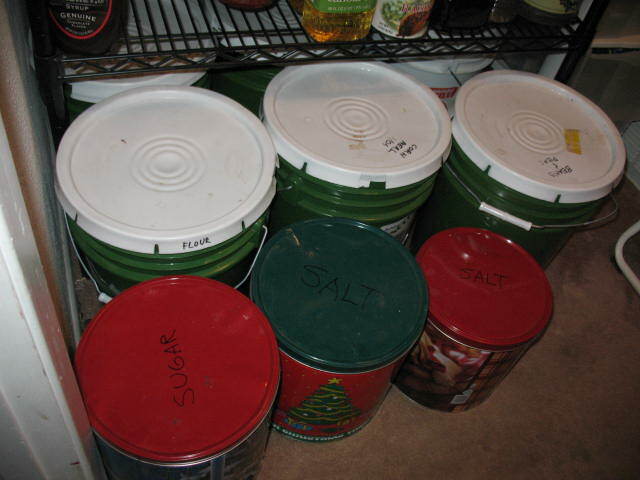 If the 5 gallon buckets are food grade, I use them to store bulk grains, flour, cornmeal, and dried beans. One time I found half-a-dozen plastic buckets that had been used for kerosene. Obviously I didn’t want to store food in them, but I bought them anyway. After a good washing, I used them to store about 240 pounds of 8-8-8 fertilizer. Waterproof and air tight, the fertilizer will stay good for years. 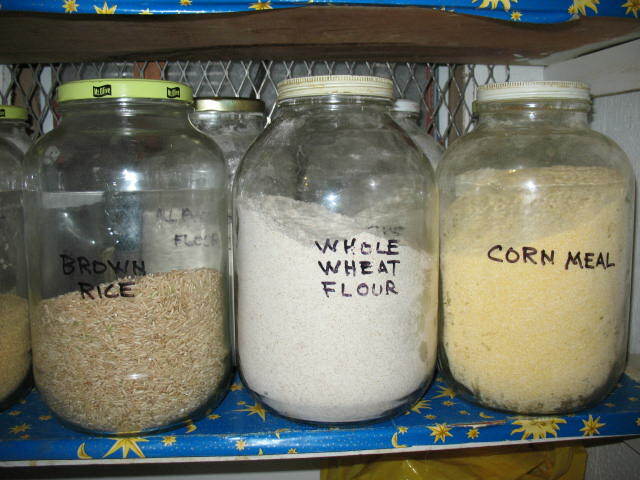 I use the one gallon glass jars to store grains, flours and beans in my kitchen pantry. Because you can see the contents, it makes them easy to locate; and they are moisture and vermin proof. The metal popcorn tins do not seal air-tight, so I use them to store stuff that will not spoil. I keep salt and sugar in sealed plastic bags inside these tins. I also keep a large selection of sealable plastic bags on hand. I do not recommend these for long-term storage unless they are going to be placed inside of a glass or metal container. Rodents (or my cat) can easily chew through plastic bags to get at the goodies inside. We have re-used canning lids that were in very good condition, with good success. The risk of having a jar not seal is increased, but we put those in the fridge to use in the next week or two. We find that re-used lids are best for use in boiling bath rather than pressure canning. My mother canned as I was growing up, and she verified that she would sometimes reuse lids on jellies and jams, but never on low-acid foods like beans and sweet corn. I’m not recommending it, but I’m saying it can be done. About 25% of the jars we open have lids that we re-use for canning. 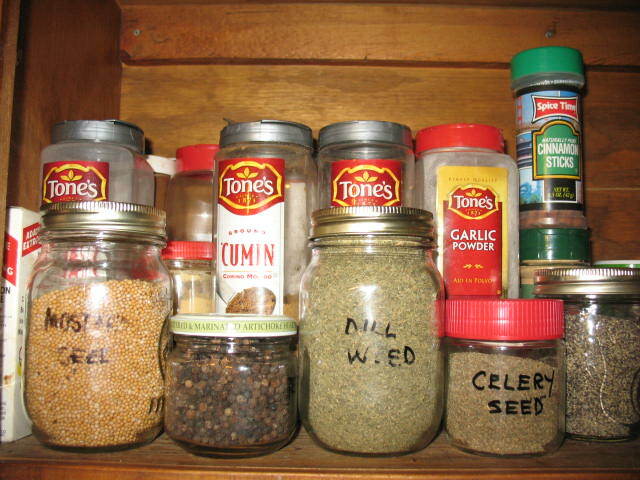 And the lids that cannot be re-used in this way are often re-used to close jars of dried foods like spices.